A few weeks ago, another blogger and I were discussing the topic of “accessibility” in fiction and film, and by way of example of the “inaccessible,” Prospero brought up the 1972 film, Solaris, directed by Andrei Tarkovsky. I had read the novel (by Stanislaw Lem, 1961) and had seen the Soderbergh/Clooney film (2002), but I’d never seen or even heard of this Soviet-era science-fiction film. So, tappity-tap-click-click, I went over to Blockbuster and found I could put it on my movie queue. It arrived last week, and I watched it over the weekend. Now, I don’t give too much weight to awards (though if Red Sonya had been nominated for the Palme d’Or, I might have stayed for the second half), and if you’re talking about inaccessibility in film and fiction, then you can hardly find better wingmen than Bergman and Rushdie. I’ve also seen several Russian and Soviet films, albeit from previous eras (e.g., Alexander Nevsky, Battleship Potemkin, etc. ), so I was prepared for the somewhat lugubrious pace that Russian directors prefer. And lastly, brought to my attention as an example of “inaccessibility,” I knew this wasn’t going to be a action-packed laugh-riot. Thus prepared, cue the music. The thing about Solaris (the novel) is that it’s a very cerebral book. This does not translate well to film, and so both of the cinematic versions of Solaris (and probably the 1968 Soviet television version, also) have stripped out Lem’s original thematic material (an exploration of the imagined difficulties in communicating with non-human intelligences) and concentrated on the “human” side of the story (an existential discussion of human thought and perception in the face of a fluid reality). Now, while this sort of thing is common in the adaptation of novels to film, what Tarkovsky has done is provided us with a science-fiction movie that isn’t necessarily science fiction. There’s a ton of material that happens on Earth (none of which exists in the book), and there’s no real examination of the fact that Solaris, the planet the characters are studying, is sentient. I can see that Solaris (1972) was a ground-breaker in its day, and some of the long, meditative shots are filled with beauty and interest to the story, but I simply do not see this as one of “The 100 Best Films Of World Cinema” (#68, according to British film magazine, Empire). For production quality, the sci-fi effects are downright amateurish, the sets look like they were set up with 2x4s in an old hangar, and the costuming and set design speak more of Carnaby Street and a dacha in suburban Moscow than they do of scientists on a space station. I mean, really; who brings a suit and tie with them to an alien planet? While I found the story that Tarkovsky decided to tell compelling, I found his artistic style and composition to be completely disconcerting. At one point, we have a nearly-real-time ride into downtown Beijing (or Pyongyang, I couldn’t tell) with no dialog whatsoever. We are simply watching a man ride in a cab, first watching him watch the passing buildings, then watching the passing buildings ourselves, back to him, back to the buildings, all with our ears assaulted by a wall of electronic noise, in a sequence that goes on for a full five minutes. And then, after spending five minutes watching this character ride in a cab, we don’t see him again for the rest of the film. Whiskey-Tango-Foxtrot? And then there’s the mixed use of black-and-white and color. When a director mixes monochrome and color films in a work, there’s usually a reason, a discernible pattern. Dorothy’s Kansas is monochrome, while Oz is in color. In Memento, one timeline is in black-and-white, the other is in color. In Tarkovsky’s Solaris, there is no pattern. I looked. And just when I thought I’d figured it out, he broke the pattern. It was maddening, it was distracting, and it was completely without apparent meaning. In the end, I figured, Hey, it’s Soviet Russia; maybe they just ran out of color film? 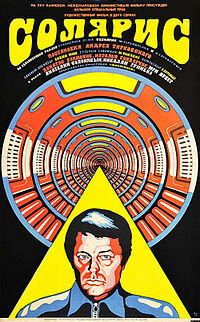 In my final estimation, Tarkovsky’s Solaris is a dated film that has not stood the test of time. Moreover, it looks like a poor-man’s copy of Kubrik’s shining (though equally opaque, at times) 2001: A Space Odyssey. I’m glad I sat through it’s nearly 3-hour running time, but I wouldn’t recommend it to anyone other than a movie junkie as an interesting night’s entertainment. Sorry, Prospero. I don’t think this is “inaccessible.” I think it’s just not that good. I will not offer a rebuttal. You are entitled to your own opinion, but you must realize that you pit yourself against the collective insight of Ingmar Bergman, Sergei Parajanov, Aleksandr Sokurov, and many others. At best, we must agree to disagree. I’m happy with that. I am not a film theorist by any stretch of the imagination. I also think that if you’re paying more than $40 for a bottle if wine, you’re just showing off, which sets me against a great many as well. Such is life. I am glad I saw it, and I do thank you for bringing it to my notice. I am now considering a purchase of the 7-hour version of _War & Peace_.